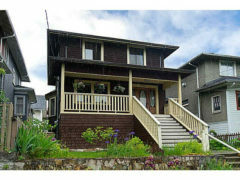 Commercial Drive Heritage Style Home! This three-storey house has been tastefully restored and upgraded. Enter through a spacious foyer leading to open living and dining rooms. Upstairs is the master and two additional bedrooms, washroom ( w/laundry) & water closet. Features include original stained glass, fixtures, & refinished wood floors. The basement contains a new modern 2 bedroom legal suite w/its own laundry. Buy w/confidence as this house has new drainage tile & sump, a new foundation, rewired electrical system, energy efficient furnace, & updated plumbing. You will love the spacious garden & its edible plants & flower boxes. All of this just steps from the heart of Commercial Dr.